Zoom's Swimmin' Super Fluke and Swimmin' Super Fluke Jr have the perfect profile with even more action with its boot tail. The Swimmin' Super Jr. is great when a smaller baitfish presentation is needed. 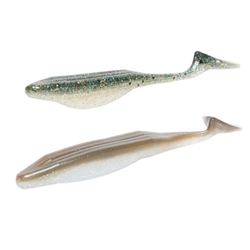 The thump and vibration of the Swimmin' Super Fluke will drive fish crazy when fished behind a jighead or on an A-Rig.